Editor’s note: Passport to Cheese is Cheese Market News’ feature series exploring the dairy industries of nations around the world. Each month this series takes an in-depth look at various nations/regions’ dairy industries with coverage of their milk and cheese statistics and key issues affecting them. The nations’ interplay with the United States also is explored. We are pleased to introduce our latest country — Germany. MADISON, Wis. — Many beloved cheeses in the United States — Butterkäse, Muenster and Limburger, for example — can trace their roots to Germany, as immigrants brought their cheesemaking traditions overseas. In turn, many of Germany’s most popular cheeses — Emmentaler, Brie, Gouda, Tilsiter and others — were brought to Germany by immigrants from other European countries, such as Switzerland, France and Holland, according to CMA Global Partners-German Foods, an independent importer, broker and trade promotion agency based in Washington, D.C.
BAVARIAN ORIGINAL — Germany’s Käserei Champignon, headquartered in the Allgäu region of Bavaria, is well-known for its soft-ripened cheeses such as Cambozola, an original style with characteristics of both soft-ripened and Blue cheeses, that the company developed in the 1970s. Germany, with its various regional traditions, landscapes and methods of production, has a long history of cheesemaking and boasts more than 600 different types of cheese, according to CMA. Bavaria, which shares borders with Austria, the Czech Republic and Switzerland in the southeast corner of Germany, is home to more than 400 of these cheeses as well as other major dairy production. “Milk production in Germany is concentrated in the area of green land and near the coast of the North Sea or the Baltic Sea. Cost of production is lower there,” says Eckhard Heuser, CEO of the Association of the German Dairy Industry (Milchindustrie-Verband, or MIV), which represents about 80 dairy companies and 95 percent of the German milk pool. “In Bavaria, we have all the big brands: Müller Milch, Danone ... One of the advantages of Bavaria is the small distance to Italy. Italy is the biggest importer of German milk products,” Heuser adds. Germany currently has about 71,000 dairy farms with 4.3 million cows, generating 32.8 million metric tons of milk per year, according to MIV data. In 2015, Germany processed 2.5 million metric tons of cheese, led by Gouda, Edam and Mozzarella varieties, respectively. Cheese and dairy production, as well as exports, have shown steady growth. “Factors that have contributed to growth was better export performance,” Heuser says. In Germany, cheese is widely regarded as a healthy food and often is consumed with bread as well as used in cooking and baking, according to a September 2016 report, “Cheese in Germany,” published by Euromonitor. Some consumers also use cheese in their breakfast routines rather than the slightly more traditional jam. In 2015, cheese consumption in Germany averaged 24.5 kilograms (54.0 pounds) per person, according to MIV. Euromonitor adds that cheese sales are expected to remain stable over the next five years. Bavaria is home to many of Germany’s famous cheeses, including the PDO Allgäuer Emmentaler, first introduced in the 1820s by Swiss dairymen, and Champignon Cambozola, a cheese developed in the 1970s that has become a popular import in the United States. Germany’s Kaserei Champignon was established in 1908 by cheesemaker Julius Hirschle and cheese wholesaler Leopold Immler in the Allgäu region of Bavaria. Hirschle had developed a Camembert that had a distinct mushroom-like aroma, therefore naming it “Champignon Camembert,” which became one of the first consumer brands established in the German dairy industry. 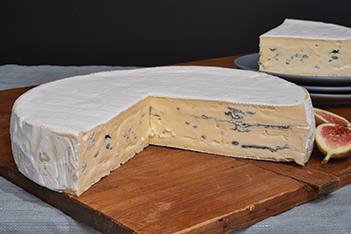 Champignon now is well-known for its original Cambozola, which is made with Penicillium roqueforti and contains characteristics of Camembert and Blue cheeses. The company started making the cheese in the 1970s and exporting it to the United States in the early 1980s through Champignon North America, which is headquartered in Englewood Cliffs, New Jersey. “It’s not one or the other, it’s its own type of cheese,” Wiley says of Cambozola. More recently, Champignon introduced the Cambozola Black Label, which is in a smaller and taller format than the original, and which was named Supreme Champion at the 2013 World Cheese Awards. One of its latest introductions, a wax-covered soft Blue cheese called Grand Noir, won reserve champion at the 2016 International Cheese Awards. Champignon also sells a number of other traditional and new cheeses, including soft-ripened cheeses with herbs and spices, and the washed-rind Rougette and Limburger. U.S. imports of specialty German cheeses such as Cambozola have been growing, but the largest portion of German cheese imports are commodity-type cheeses, according to Thom Phiebig, owner and president of Galaxy Dairy Products, Ramsey, New Jersey, which imports cheeses from Bayernland, a large co-op in Nurnberg, Germany. In 2015, the United States imported 9,316 metric tons of cheese from Germany, almost half of which was Swiss/Emmentaler, according to data from USDA’s Foreign Agricultural Service. Galaxy Dairy Products imports mainly bulk Swiss from Bayernland, which is sold in sliced formats in club stores. The company also imports Butterkäse from Bayernland, which has done well in stores like Costco and Trader Joe’s. The German Swiss and other commodity cheeses tend to be price-driven, Phiebig notes. He adds that with a renewed interest in specialty items, there has been growth in U.S. demand for German specialty cheeses, though these comprise relatively small volumes compared to commodity imports. Champignon in 2016 rebranded St. Mang Limburger as well as a line of soft-ripened cheeses to “St. Mang Bavarian Made” in an effort to highlight the story and origins behind these cheeses for international consumers.